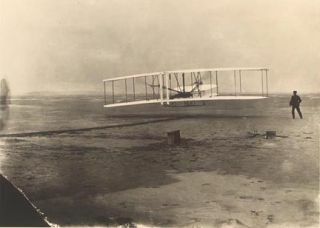 The first flight by the Wright Brothers. The First Hot-Air Balloon: Modern flight began with observations of a paper bag rising on the flow of heated air. French brothers Joseph-Michael and Jacques-Ètienne Montgolfier built and flew a number of hot-air balloons starting in 1783 that carried a sheep, a duck, a rooster and eventually human passengers. The First Powered Airship: The French connection also inspired another big moment for flight. Charles Renard and Arthur C. Krebs, inventors and military officers in the French Army Corps of Engineers, built the first powered airship that could control its flight effectively by using a battery-powered electric motor and wooden propeller. World's First Commercial Airline: The first scheduled airline passengers didn't get peanuts and soft drinks, but they did get to fly between St. Petersburg and Tampa, Fla., in just 20 minutes — far shorter than the many hours of travel required for a steamship, train or car. The St. Petersburg-Tampa Airboat Line heralded a new way for everyone to fly despite lasting just four months after its Jan. 1, 1914, debut. The Spirit of St. Louis carried Charles Lindbergh from New York to Paris in 33 and a half hours, the first nonstop flight across the Atlantic Ocean. Charles Lindbergh & the First Solo Transatlantic Flight: Flying across the Atlantic seemed like a job for either very brave or very foolish pilots, especially alone and in a single-engine aircraft such as the Spirit of St. Louis. That did not stop Charles Lindbergh from making the first transatlantic flight in 34 hours and changing the world's views on the possibilities of air travel. Breaking the Sound Barrier: Only bullets, cannon balls and Superman had broken the sound barrier before Chuck Yeager climbed into a U.S. Air Force experimental rocket-powered aircraft on Oct. 14, 1947. The Bell X-1 used four rocket engines and a shape modeled after a machine gun bullet to help Yeager break the sound barrier and set a new milestone for future aircraft. The First Man in Space: Yuri Gagarin had to face risky flight conditions and the scary unknowns of spaceflight to become the first human in space on April 12, 1961. His 108-minute orbit of the Earth aboard the Soviet Vostok 1 spacecraft opened the era of manned spaceflight and escalated the space race between the Soviet Union and the United States — a race leading to the first manned moon mission. Apollo 11: First Men on the Moon: Two U.S. astronauts, Neil Armstrong and "Buzz" Aldrin, became worldwide celebrities when they climbed down their lunar module ladder and set foot on the moon on July 20, 1969. The space explorers left behind their footprints, part of their spacecraft and an American flag to symbolize humanity's first steps on an extraterrestrial surface. Salyut 1: The First Space Station: Two separate crews of Soviet cosmonauts suffered near-fatal accidents and death during their return trips from the Soviet Salyut 1, the world's first space station. But Salyut 1 still helped pioneer methods for living and working in space over long periods in its 175 days in space following launch in 1971. Space Shuttle Launches New Era in Exploration: Space shuttle Columbia launched on its first historic flight on April 12, 1981 —20 years to the day after Yuri Gagarin became the first man in space. The iconic spacecraft and its four sister ships eventually carried more than 850 astronauts into space over three decades despite the twin tragedies of Challenger and Columbia.